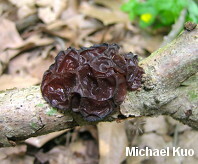 This distinctive jelly fungus is especially common in the Midwest, where it appears on hardwood sticks and branches after late spring rains and throughout the mushroom season. 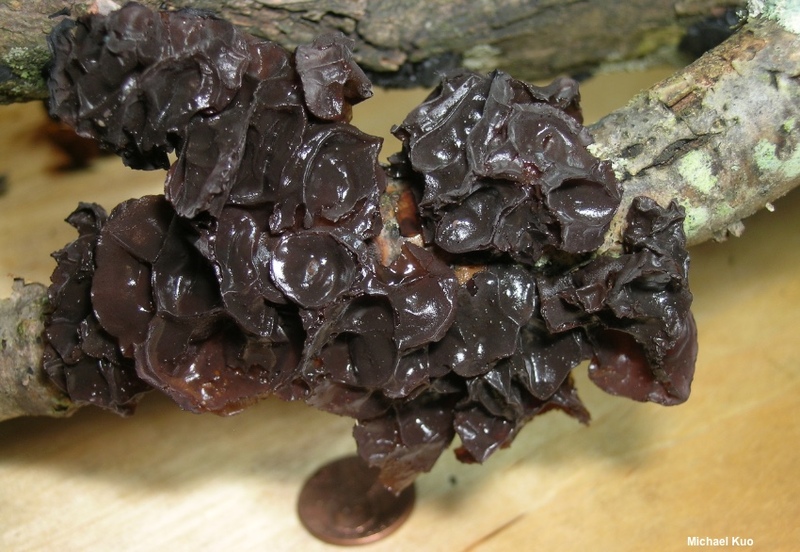 It can be recognized by its brown to purplish brown colors, and the fact that its surface develops wide concave depressions that are surrounded by ridges. Additionally, it makes fairly discrete individual fruiting bodies, which are attached at a central point (sometimes by a stem-like structure); look-alike jelly fungi tend to be more glob-like or brain-like, fusing the individuals together so that they are hard to separate. 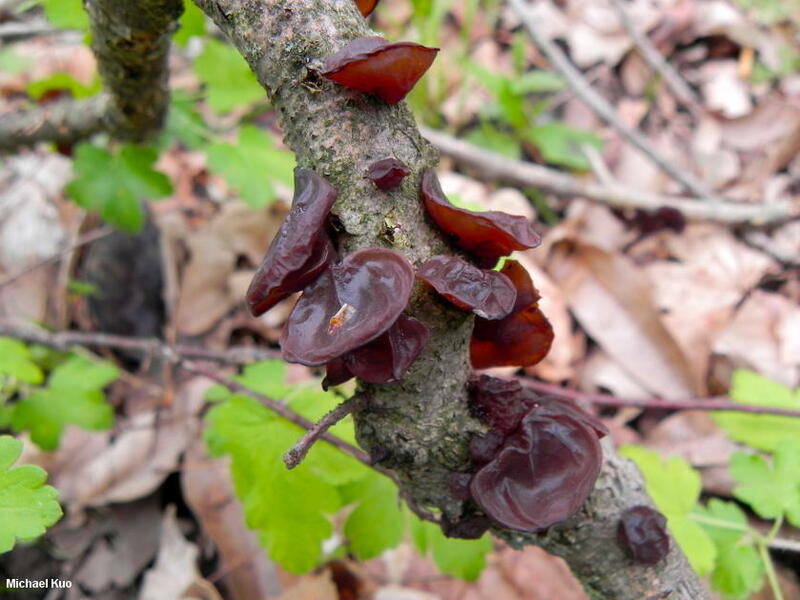 Ecology: Saprobic; growing on recently fallen hardwood sticks and branches (especially on the wood of oaks); spring through fall; apparently widely distributed in North America, but much more common east of the Rocky Mountains. The illustrated and described collections are from Illinois and Québec. 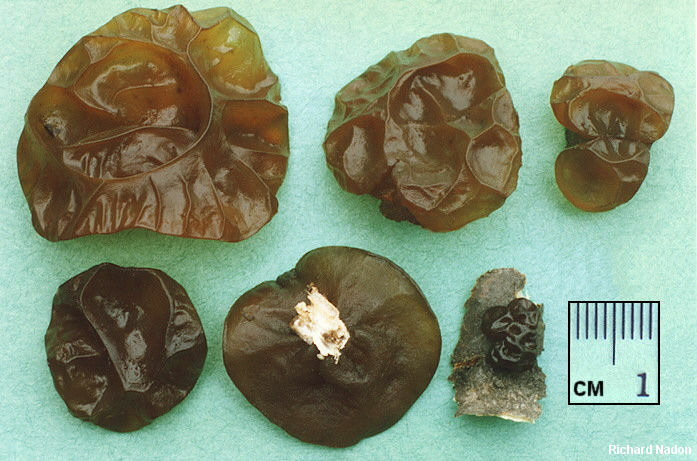 Fruiting Body: Individual fruiting bodies are 1–4 cm across, but are typically clustered together to appear as a larger mass; gelatinous but fairly firm; lobed, with concave depressions separated by ridges; usually featuring a small pseudostem—or at least attached more or less centrally at a pinched point; dark brown, often with a purplish cast; bald; undersurface dull brown; blackening along the edges and ridges when dried out. 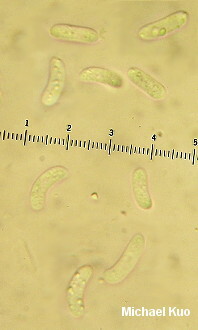 Microscopic Features: Spores 10–17 x 2.5–4 µm; allantoid; smooth; hyaline in KOH. 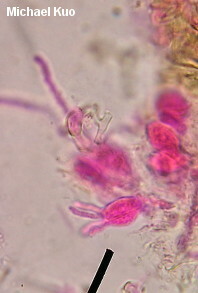 Basidia to about 15 x 8 µm; pyriform to subglobose; developing a longitudinal septum and long, fingerlike sterigmata. 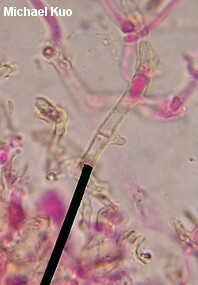 Hyphae 2–4 µm wide; often gelatinized; septate; clamped. REFERENCES: (Ditmar, 1813) Fries, 1822. (Saccardo, 1888; Olive, 1947; Olive, 1948; Martin, 1952; Lowy, 1971; Breitenbach & Kränzlin, 1986; McNeil, 2006; Kuo & Methven, 2014; Baroni, 2017; Elliott & Stephenson, 2018.) Herb. Kuo 04179502, 05191002, 04241101, 01221701.